Layering stamps have become so popular…I finally decided to try an idea I had! Most folks I’ve seen using these have stamped with different colors of dye inks or pigment inks…I can’t do that since I don’t collect all the colors in those kinds of inks. I focus so much on coloring, that it’s not worth it to me to buy and have to store all those. I wondered if it’d work with distress inks, though, and would I be able to move some of the color with water too. I liked it! Watch the video below or click HERE to see it in HD on YouTube. Not only are there flamingoes – but tons of others too. 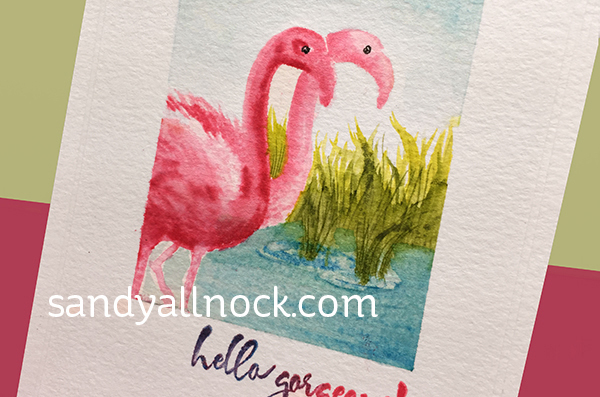 See the list in the description to get you started – try them with distress inks or water based markers, too, and tag me on instagram if you get them to work too! This card is a stunner. Thank you SO MUCH for sharing your beautiful work! 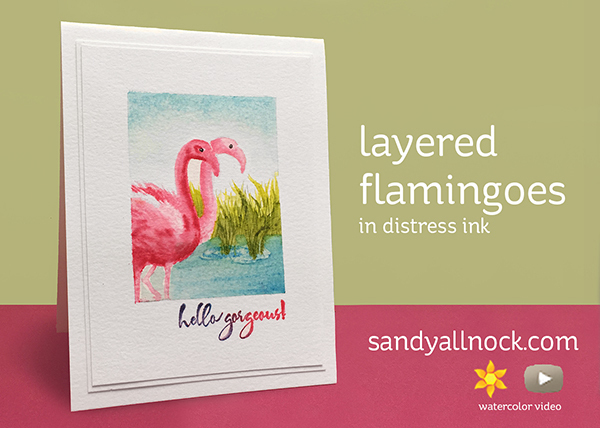 Love the flamingoes and the scene you created using distress inks! Thanks for the video showing all the steps you took from the first smoosh of pink (that I’ll admit made me wonder) to the beautiful finished card. Lovely card. I like how you did the framing with other pieces of watercolor paper. Which glue did you use? I have a hard time finding one that sticks to watercolor paper.